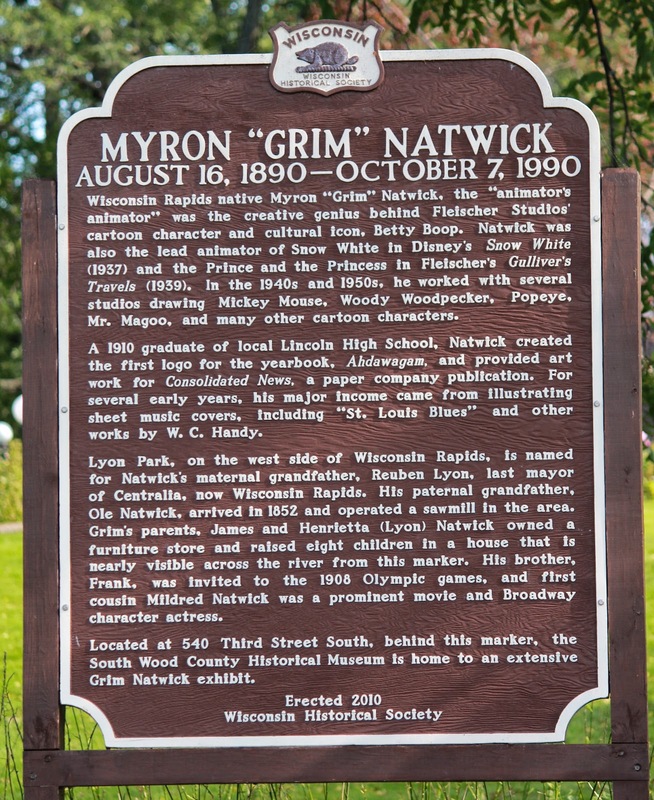 Wisconsin Rapids native Myron "Grim" Natwick, the "animator's animator" was the creative genius behind Fleischer Studios' cartoon character and cultural icon, Betty Boop. Natwick was also the lead animator of Snow White in Disney's Snow White (1937) and the Prince and the Princess in Fleischer's Gulliver's Travels (1939). In the 1940s and 1950s, he worked with several studios drawing Mickey Mouse, Woody Woodpecker, Popeye, Mr. Magoo, and many other cartoon characters. A 1910 graduate of local Lincoln High School, Natwick created the first logo for the yearbook, Ahdawagam, and provided art work for Consolidated News, a paper company publication. For several early years, his major income came from illustrating sheet music covers, including "St. Louis Blues" and other works by W.C. Handy. Lyon Park, on the west side of Wisconsin Rapids, is named for Natwick's maternal grandfather, Reuben Lyon, last mayor of Centralia, now Wisconsin Rapids. His paternal grandfather, Ole Natwick, arrived in 1852 and operated a sawmill in the area. Grim's parents, James and Henrietta (Lyon) Natwick owned a furniture store and raised eight children in a house that is nearly visible across the river from this marker. His brother, Frank, was invited to the 1908 Olympic games, and first cousin Mildred Natwick was a prominent movie and Broadway character actress. Located at 540 Third Street South, behind this marker, the South Wood County Historical Museum is home to an extensive Grim Natwick exhibit. The marker is located behind the South Wood County Historical Museum on northbound 2nd Street South, south of its intersection with Locust Street, Wisconsin Rapids, Wisconsin 54494. The address of the South Wood County Historical Museum is 540 Third Street South, Wisconsin Rapids, Wisconsin 54494. Fleischer Studios' cartoon character and cultural icon, Betty Boop. Natwick was the lead animator of Snow White in Disney's Snow White (1937). The South Wood County Historical Museum. With the South Wood County Historical Museum in the background. located at 504 Third Street South, Wisconsin Rapids, Wisconsin 54494. The marker is located in Wisconsin Rapids, Wisconsin.